This is Part I of a two-part series of my interview with Kimera Systems, an Artificial General Intelligence (AGI) technology company that is challenging our current systems: our global economic model, how we currently use digital and how that has to change for a collective path forward. Today, we are witnessing an unrelenting turbulence in technology, concurrent with the human-induced threats to our planet and ultimately humanity. The opportunities to drive progress beyond this world are bound by the very resources that accelerate climate vulnerabilities, and also perpetuate income and racial disparities. In developed and developing countries alike, the poorest half of the population often controls less than 10% of its wealth. While it is true that around the world economic growth is picking up pace, deep challenges remain, including poverty, environmental degradation, persistent unemployment, political instability, violence and conflict. A more networked world is more vulnerable to cybersecurity risks, and it also creates concentration risks…other financial institutions are increasingly building and adopting AI and machine learning products that reside in the cloud. A decade ago, these cloud-based solutions may have been used by one institution, but now we’re now seeing dozens, or even hundreds of banks and markets accessing the same set of tools — a central point of failure and a juicy target for bad actors. I could see the WEF warning happening. When it comes to evolutionary AI, that still wouldn’t be my fear. My fear is growing inequality and cementing the current global economic and power structure which I’m convinced will slow down the process towards a world full of general AI. We need to come up with new ideas and models to address those fears. What I’ve noticed over the years is that general AI research … is treated as “just another” powerful technology. In reality, if common AGI [Artificial General Intelligence] visions are to be realized, it isn’t a great killer hardware product; it’s dismantling the current global economics and building up a new one that will feed a future vision of a smarter planet. I could be wrong, but early in our research we could not come up with a path to the future within our current global economic model. With its great potential to change humanity, AGI should be controlled by humanity, not large corporations, single entities, or governments. Data is a resource for the digital economy, yet only a few are benefitting from it whilst the vast majority of people providing the source of monetization are not benefitting. That inbalance needs correction because automation continues and thus data generation becomes more essential. The individual does not have a choice today; that needs to be corrected. While AI has been emerging for decades, the implementation of this hailed panacea is still very much in its infancy. While significant breakthroughs have occurred within the ANI [Artificial Narrow Intelligence] there is a prevailing view that AI and Machine Learning have further to go before they move into the mainstream. Geoffrey Hinton, Fei Fei Li, and Andrew Ng, among others, have warned of an impending AI Winter, which includes a necessary reset to determine why Deep Learning doesn’t scale. While the industry continues to experiment in ANI, one lone wolf has carved his own path towards Artificial General Intelligence. Mounir Shita and his team want to change the world. As a serial entrepreneur with a background in computer science, Mounir envisions a world where the devices, which are now symbiotic with their owners, are not merely tools, but will proactively participate in helping people achieve their goals. Those “goals” can vary from simple to very sophisticated ie from having a coffee to finding a cure for cancer. Mounir remembers, as a teenager, spending every dime he earned in building things for his “Star Trek” room. He acknowledges if there were time machines, he would have moved to the future long ago. 1997 was his first introduction to AI. Mounir attended the University College of Southeast Norway and it was here he developed a speaker-independent speech recognition AI system. Years prior, he worked on university-related and independent research projects on self-learning speech systems and intelligent machines. He focused on building an electronic system with embedded software using sensors to “sense the world”. In 2005, after closing the first round of funding for his mobile payment start-up, his team had convinced the state of Oregon to take payments for state institutions. The realization that getting permission from the decision makers ie from the “people”, not the “state” contributed to the fundamental difference between knowing and understanding this reality. It led Mounir to question what it would look like to build a technology for general intelligence or thinking machines, where everything around us was intelligent and understood humans. Nerve cells in the brain, or neurons, are known to communicate among themselves by transmitting electrical signals, aided by chemical signaling at the synapses connecting the neurons. But there are gaps in understanding how that process takes the brain from perceptions to thoughts to actions. It was obvious to me that we needed to develop a testable theory what intelligence was. Before we even thought about technology or wrote a single line of code, we needed to develop a theory of intelligence. From Kimera’s point of view, the definition of intelligence is the process of changing the composition of space-time. Gabriele points out time is relative in space. On earth, we have defined time in hours, minutes and seconds. In space, this is not valid. There can be no limits to learning in space-time. It occurred to me that I don’t believe there is a single goal you can define that can be reached without changing the location or position or composition of a single particle. This led Mounir to dive into Einstein’s other theories – one in particular, that hypothesized “free will was just an illusion”. In other words, past, present, and future exist but they are set in stone. Mounir didn’t want to agree with this predestined view because if Einstein was correct, then intelligence would be pointless. We [humans] are just part of a movie playing [to a predetermined ending]… I went along with the assumption Einstein was wrong and tried to fit in the idea of changing space-time without invalidating free will. It’s here that Mounir ascribed to the General Theory of Intelligence, a quantum physics definition, based on a flexible block universe. As he explains, just like water, if you change something on one end, it will create a ripple effect in all directions. Unlike current AI methods which weight events and factors against outcomes, Mounir points out that modelling every particle’s behavior is unnecessary. Rather, we just need to model for cause and effect. Dr. Judea Perl, Computer Scientist from UCLA studied the science of causality and “instigated” a causal revolution, denouncing the mantra “Correlation is not causation”, which scientists stood by for over a century. The Book of Why surfaces the “essence of human thought” and how it plays into AI. What we have realized is we can create a computer algorithm that can model “I want a coffee” [cause] and “I get a coffee” [effect] at a high level. As it learns more of how reality works, it will go deeper and deeper into these series of causes of effects in between to make the algorithm more intelligent but increasingly more creative. I truly believe cause and effect are fundamental to any type of intelligence. And this is how AGI differs from AI. We don’t live in a world where everything is independent of each other. For Mounir, that is the fundamental problem with Narrow AI (ANI). It is designed for one specific problem that cannot necessarily be generalized. He agrees with Geoff Hinton, Andrew Ng and other AI thought leaders about the current state AI. I don’t think there is a path forward for AlphaGo or any Deep Learning technology. Andrew Ng revealed this great slide that showed how Deep Learning will never get to thinking… It’s not about being really good at one game and I’ve often said to people, if you want to understand true human intelligence, the first question a human would ask is Why? Why am I playing this game right now? Is it to beat the high score? Or to win a prize ? Or because I’m bored? That is not happening with Deep Learning. Mounir loved the idea of having super intelligence around him, through things and devices, which he wanted to enable within his lifetime. He started with the assumption that the world was full of intelligent things. 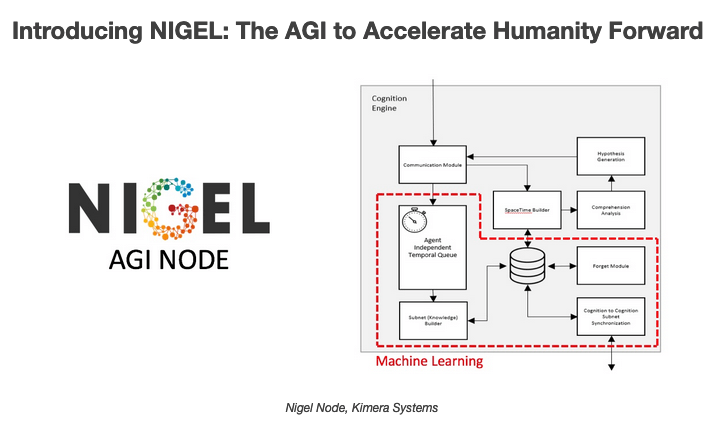 Nigel would be the catalyst to make every device intelligent. Unlike today’s standards, developing a proof of concept for AGI is, in and of itself, difficult because it isn’t designed to solve ONE problem. Otherwise, it wouldn’t be general. Nigel needed to be reared (the same way as raising a child). In one experiment Mounir was teaching Nigel to conceptualize the idea of home. The goal was for Nigel to recognize home as a location but understand it would be subjective to each user. Mounir trained Nigel by coming home each day and simply saying “home”. Nigel picked up the sensor data and figured out that “home” was equal to Mounir’s physical address. Nigel was exposed to the same scenario among other people and he was able to discern that other people had their own addresses. Nigel does not have human senses. It has its own senses and defines knowledge in different ways than we, as humans, define knowledge. When rearing Nigel, the priority is not forcing the accepted human knowledge we know to be true, but rather discovering how a machine will connect the dots differently to the same knowledge … That’s how we define creativity and comprehension. Nigel’s role is to adapt to human’s goals to help them achieve only their goals. The direct connection to the end user is the reason why Kimera is currently working with network operators and device manufacturers. By targeting at the device level and consumer level, Nigel can proactively establish peer-to-peer connections, enabling more intelligent devices and a network that will surface individualized solutions for users in their daily lives. If I am scheduled to go to the dentist, my phone will connect me to the right application and a driver to get me to the dentist on time. However, humans have many goals. Kimera’s objective is to allow users to achieve their goal, without impeding other ones. This intelligent network will connect individuals directly to what they need, decentralizing source and target to the individual, which also means bypassing current digital giants – the middlemen, which are not contributing to individual value today. It gives the individual control of their data and how they are being used. Instead of reactive behavior, people can proactively manage their information. We call it also the re-engineering of the original thought of the internet design. The internet was meant to democratize knowledge; monetization could not be forseen. Eventually, monetization could only happen by centralizing data and profiles. Kimera will change that by putting the individual at the centre of control. Mounir agrees, and this is how AGI will transform society’s current economic model. As CEO of Kimera Systems, the company he founded in 2012, Mounir is leading a team of talented engineers and business executives in revolutionizing the way technology and humans interact. Previously, Mounir founded Cybility, an e-commerce risk management system that continues to operate today under the brand name Merchant Armor. 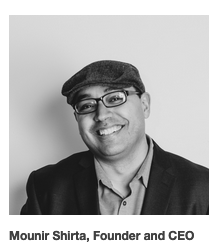 Prior to Cybility, Mounir was the founder and Chief Innovation Officer of GoLife Mobile, a cross-platform mobile application development and delivery framework. Before GoLife, Mounir was founder and CTO of PayWi, a cutting-edge mobile and social payment platform that became a media darling. Mounir sold his stake in PayWi to help finance his continued research in AGI and his other ventures. Mounir holds a degree in electrical engineering from Raelingen Technical College in Raelingen, Norway; technical degree from University College of Southeast Norway; a Bachelor of Science in electrical engineering technology from the Oregon Institute of Technology in Klamath Falls, Oregon; and master’s degree in innovation and entrepreneurship from Full Sail University of Orlando, Florida. Artificial general intelligence will change the world, so the Company is already looking beyond its North America headquarters to bring AGI to the world. To lead the Company’s planned international expansion, Kimera has turned to an executive with a proven track record in helping technology companies enter new markets, Gabriele Viebach. Gabriele is assisting and advising Kimera in business development efforts with Telecom carriers across Europe and Asia. 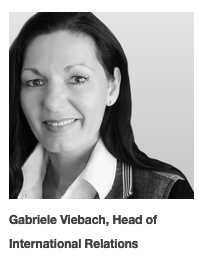 Gabriele Viebach is a strategist, lateral thinker and “maker.” She’s worked for various international software companies as a strategy advisor and holds positions as a member of their boards or executive committees. Gabriele supports innovative corporate incubator concepts, creates and refines corporate structures to align with defined strategy, and designs global go-to-market plans for the digital economy. Prior to joining Kimera, Gabriele was a management consultant, offering strategic advice to IT and telecom companies, helping them adjust to dynamically changing markets. She was CEO of eZ Systems, a global open-source, customer experience management software vendor. Gabi was a global account director for British Telecom and global accounts manager for BEA Systems. She worked in IT sales addressing the telecom vertical for Object Design after having served eight years in corporate and regional business development for T-Mobile. Gabriele is a member of the board at taskforce, a position she’s held since summer. Based in Germany, she speaks three languages and holds a degree in international economics from the University of Hagen in Cologne, Germany. This post originally appeared on Cognitive World. Can Technology Influence Humanity in the Workplace?